Supercomputer for Astronomy “ATERUI” Upgraded to Double its Speed. The Center for Computational Astrophysics (CfCA) of the National Astronomical Observatory of Japan upgraded the supercomputer Cray XC30 system “ATERUI”. By introducing state-of-the-art CPUs, the theoretical peak performance increased from 502 Tflops to 1.058 Pflops, which means that ATERUI made the leap to become a petaflops computer. The new ATERUI will expand the horizons for simulations to understand the Universe and astrophysical phenomena. Data obtained by observations are snapshots of astronomical phenomena. To understand these data, we need to construct theories based on physics, and conduct experiments based on those theories. However, virtually no astronomical phenomena can be reconstructed in a laboratory due to the spatial and time scales involved. On the other hand, theoretical astronomy tries to understand astronomical phenomena by solving equations. In some cases, it is not easy to solve the equations by hand, so powerful computers assist astronomers. Simulation astronomers construct specific astronomical objects, or even the Universe itself, in computers and perform simulations to compare with the observed Universe. With the rapid progress of computer technology, numerical simulations in astronomy are regarded as the third approach to astronomical research, alongside observational and theoretical astronomy. 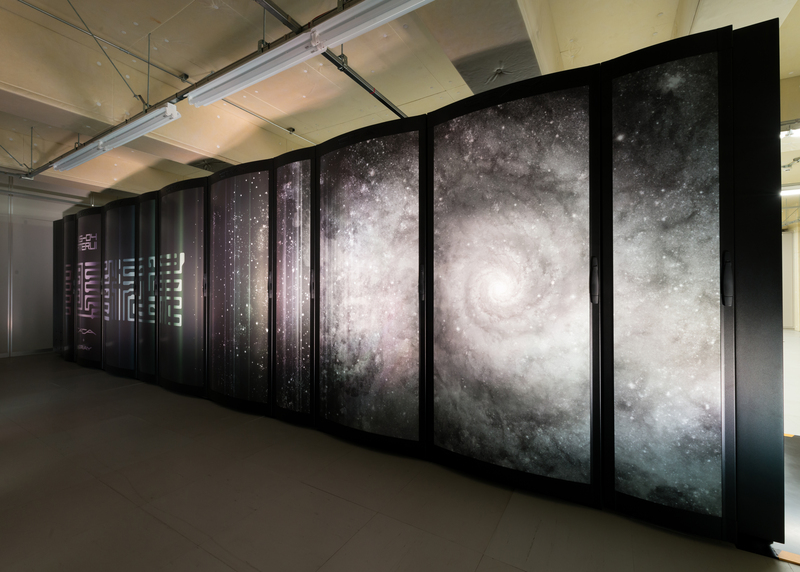 CfCA operates supercomputers for astronomical simulations. Cray XC30 system “ATERUI” installed in the NAOJ Mizusawa campus in April 2013 is NAOJ’s 4th generation supercomputer for numerical simulation. 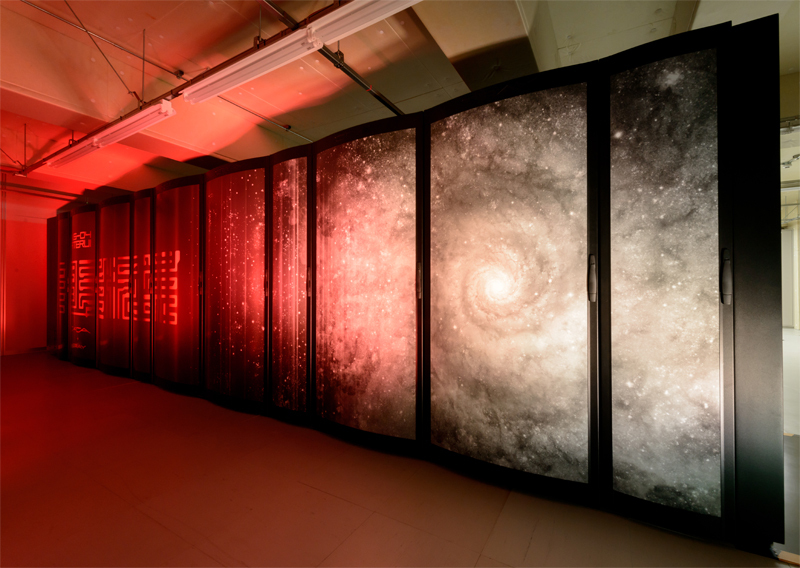 This system is a scalar type massively parallel supercomputer. With the theoretical peak performance of 502 Tflops, ATERUI was the world’s fastest supercomputer dedicated to astronomical simulation. ATERUI accelerated our understanding in various fields of astrophysics, but astronomers’ requirements for computer performance have become higher and higher. Responding to the increasing demand, ATERUI had a “surgery” to introduce a new “brain” during September 11th-30th, 2014. In this operation, the old CPUs were exchanged with new CPUs. The number of cabinets decreased from 8 to 6, and the interconnects between CPUs were reconnected. Although the number of cabinets decreased, the theoretical peak performance approximately doubled from 502 Tflops to 1058 Tflops(=1.058 Pflops). This means that ATERUI can perform one thousand trillion calculations per second. This marks the best performance in the world for an astronomical simulation supercomputer. 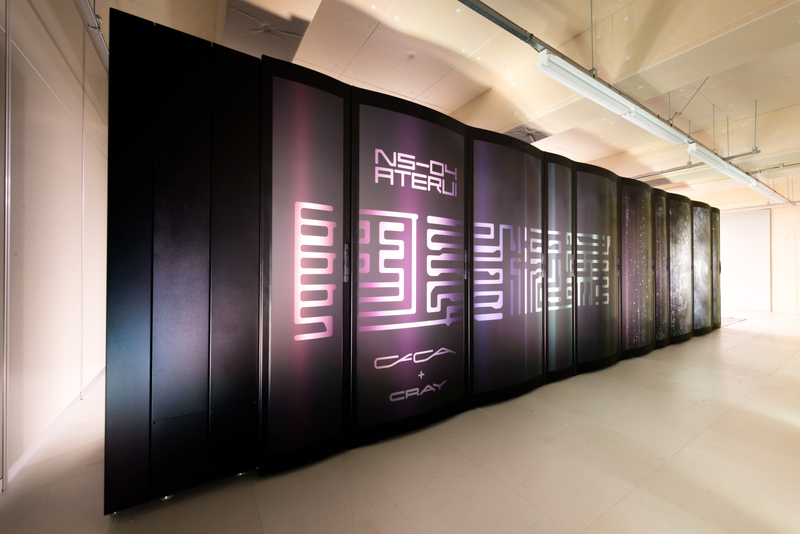 ATERUI became the first petaflops supercomputer operated by NAOJ. Figure2: A staff member of the Cray Japan Inc. exchanging a blade. 266 blades for calculations were replaced. The renewed ATERUI has started operation from Oct 1st, 2014 and 127 researchers have been using this new system. The users include researchers and graduate students not only in NAOJ, but also in universities and other institutes in Japan, and Japanese researchers abroad. ATERUI runs various simulations: the formation of planets, the birth and death of stars, the activity of the Sun, the evolution of black holes, the formation of galaxies and clusters of galaxies and the large scale structure of the Universe. For example, in simulations of supernovae and mergers of binary neutron stars, the complicated high-energy physics has to be considered. These simulations need huge computing power, and the new ATERUI will conduct more realistic simulations for these complicated phenomena. In addition, smaller time steps for calculations provide more accurate behaviors for phenomena. The new ATERUI will be able to follow more accurately the motions of particles like stars and fluids like interstellar gas or plasma gas. Moreover, higher spatial resolution provides fine structure for celestial objects and the structure of the Universe. For example, one simulation with new ATERUI can provide various views of the Universe ranging from the large-scale structure down to the scale of individual galaxies. Professor Eiichiro Kokubo, the CfCA project director says, “Supercomputers for astronomical researches can be called ‘telescopes for theoretical astronomy’ because they illustrate astrophysical phenomena that telescopes cannot see. New visions of the Universe which have never been seen before will be revealed by more realistic simulations using the new ATERUI”.